Recently I came into posession of an Ensoniq Fizmo, an underrated wavetable synthesizer cast in the tradition of PPG and Waldorf boards. The Fizmo never really caught on partly because some aspects of its UI are impenetrable and partly because they had a habit of unexpectedly dying and frying their main DSP board in the process. Originally, this was erroneously blamed on the supplied wall-wart power supplys. A few years back, it was finally figured out that an under-speced voltage regulator had been installed in almost all Fizmos. Does your purple monster have this defect? Look at the regulator - it might say MC7805 on it if its been "repaired", something else if its a factory fix. If it says LM2940, you have a problem. Looking at the regulator is easy and it dosent require complete disassembly of the synth...just take the bottom off and look - you might want to unplug it first though! Also, please be careful! 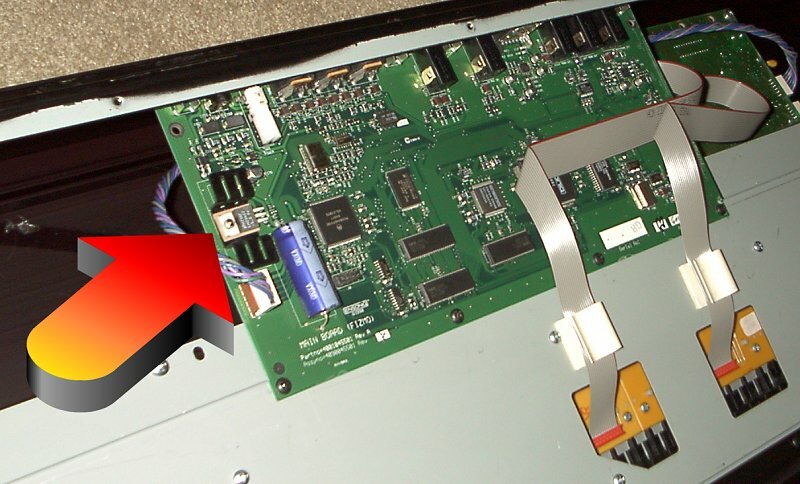 Capacitors (like that big blue cylinder in the picture) can hold a charge, even if the synth is powered down - basically, don't touch the circuit board if you don't need to. Its a simple fix if you're no stranger to the iron or, alternatively, its relativly cheap to have a tech fix it for you. If you have one of these wild synths you owe it to yourself to get it repaired or one day it will powerup totally silent with only the dreaded "ESP" message on the display. One thing to note, If you do this fix, put the caps on the opposite side of the board from the regulator - its easier to solder them on plus there's no chance of the leads shorting out against anything! Remember to tin the leads first. If you're not proficient with a soldering iron, DON'T DO THIS YOURSELF! ...I had a Fizmo some years ago and loved the sound but finally unloaded it because everybody's seemed to be dying. Its great to be able to have one in my setup again - and to be able to finally address this deadly "birth defect". I'd like to thank Ugo, head of the Fizmo Users Group and Norm Vogel for their knowledge and, of course, the fix.